About 45,000 people are diagnosed with the cancer every year in the UK. Symptoms of the condition don’t tend to show during its early stages, but signs can develop over time. 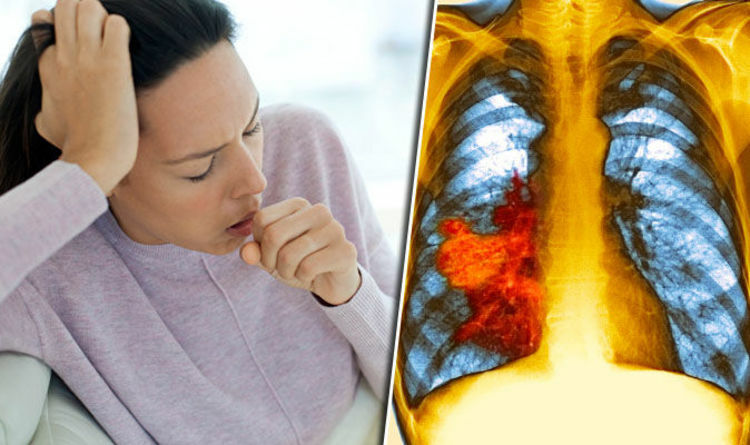 Having a cough that doesn’t go away, even after two or three weeks, could be a sign of lung cancer, according to the NHS. Other signs of the cancer include persistent chest infections, and coughing up blood. Having an ache or pain when breathing or coughing could also point to the condition. Persistent tiredness, lack of energy, unexplained weight loss and breathlessness are also lung cancer symptoms. Finger clubbing is a less common sign. That’s where the fingers or nails become more curved than usual, or they become larger at the ends. “You might be coughing up rust coloured phlegm, or your sputum might have flecks of red in it,” said Cancer Research UK. “You might have lost your appetite or may not feel like eating foods that you normally like. You might [also] have pain in your chest or shoulder. It could be a dull ache or a sharper pain. The symptoms develop as the condition progresses, so they may become worse over time. More than 85 per cent of lung cancer cases are caused by smoking, the NHS said. Smoking 25 cigarettes a day increases the risk of lung cancer by 25 times, compared to a non-smoker. The naturally-occurring radioactive gas radon could also lead to the condition. Three per cent of all cases are caused by radon, which damages lungs when bathed in. Some workers are more exposed to cancerous chemicals than others, too. Exposure to arsenic, asbestos, cadmium and beryllium could increase the risk of lung cancer.